The fact is most drivers today are distracted. Double patty cheeseburgers, cell phones, and noisy kids can make it almost impossible for an emergency vehicle to get noticed, even when running a full complement of lights and strobes. Sometimes the best way to get attention is to blast through the distractions with a sound alert system loud enough to wake the dead. 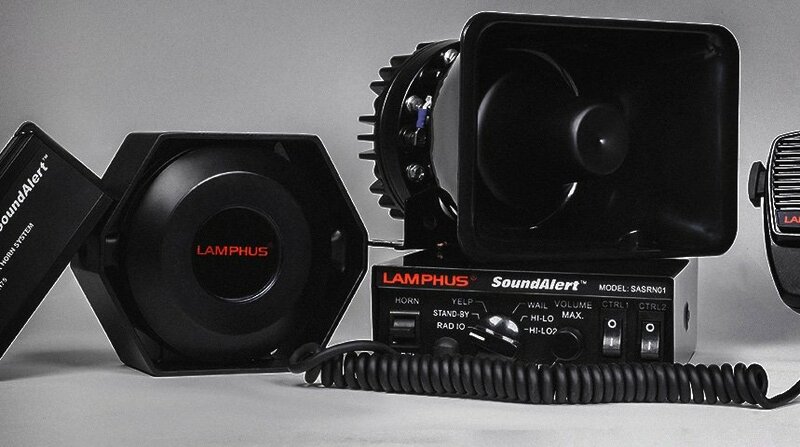 So when it comes time to repair, replace, or upgrade your sirens, air horns, or PA system, take a look at our top of the line emergency sound alert equipment for sale. When appropriate, emergency vehicles are allowed to cautiously disregard certain traffic laws, such as speed limits, lane lines, and red lights when responding to an emergency. However, it is vital that other drivers on the road are aware of your presence and intentions if you are to maintain the highest possible level of safety while en route. An electronic air horn is one of the best ways to announce your presence and warn people that a large, fast-moving vehicle is approaching. Loud and impressive, our emergency air horns come with everything you need to make sure you get noticed. Back up alarms are loud and irritating. But that’s exactly what they’re designed to be. Required on any vehicle with an obstructed rear line of sight, vehicle back up alarms keep workers safe on construction sites, loading docks, and bus yards. And even though they’re one more thing you have to buy, they’re irritating, and they take time to install and maintain, in the end, properly functioning back up alarms for heavy equipment cost less than a hospital bill, aren’t nearly as irritating as filling out forms for workers comp, and are easier to maintain than a wheelchair. Lights, while an effective and necessary tool, are virtually useless if they can’t be seen. This is especially true in urban environments where buildings and other obstructions may prevent drivers from noticing an emergency vehicle until it is right on top of them, a dangerous situation even at the best of times. With sirens and PA speaker systems for fire and police vehicles, you can alert others to your presence even if they can’t see you. An effective sound alert system can save time and money, prevent accidents, and save lives.